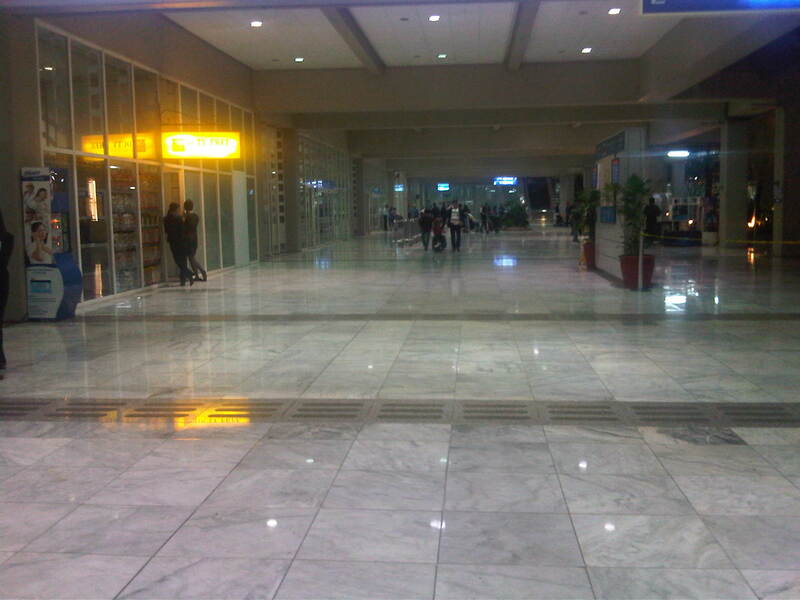 Arriving at NAIA Terminal 1, I was curious to see if there have been significant improvements in the terminal as the arrival corridors and facilities would probably give visitors a first impression of Metro Manila and the country as well. 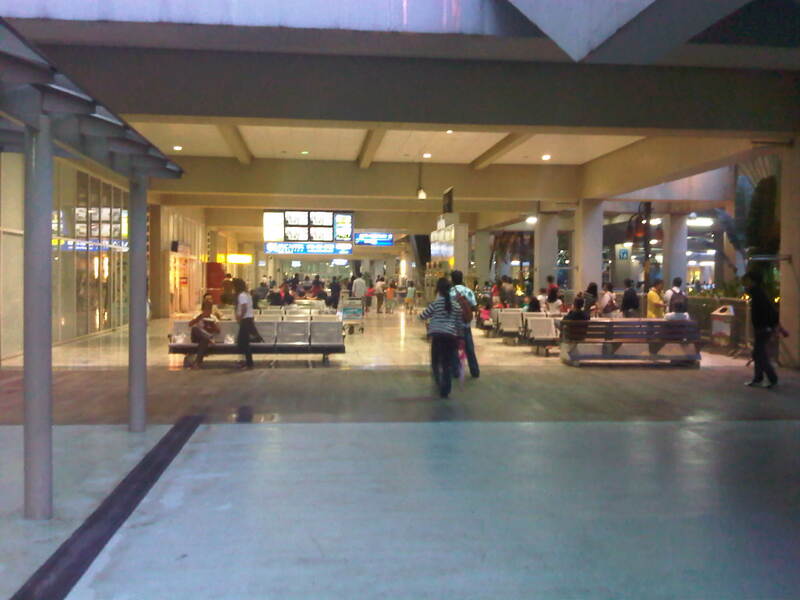 Terminal 1 serves all other international carriers with flights to Manila with only Japanese airline All Nippon Airways using Terminal 3 for its flights. 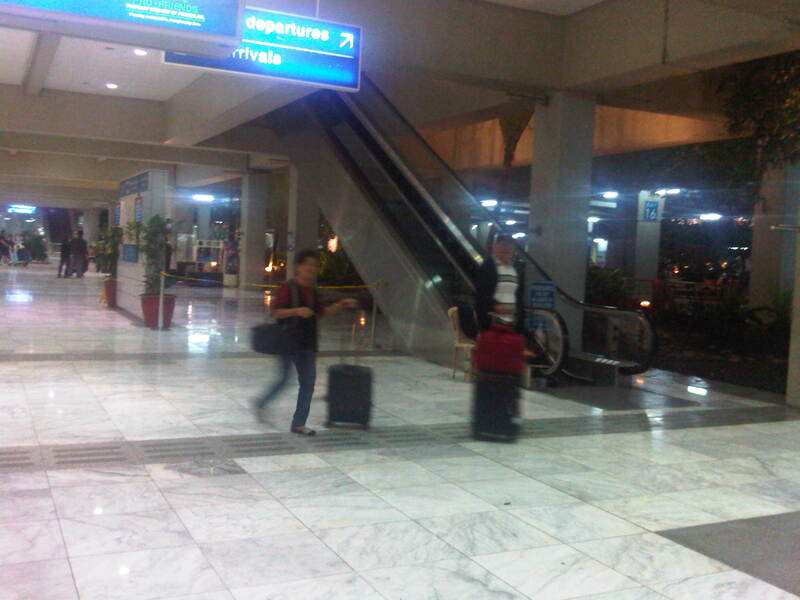 Domestic carriers Philippine Airlines and Cebu Pacific operate to and from Terminals 2 and 3, respectively. 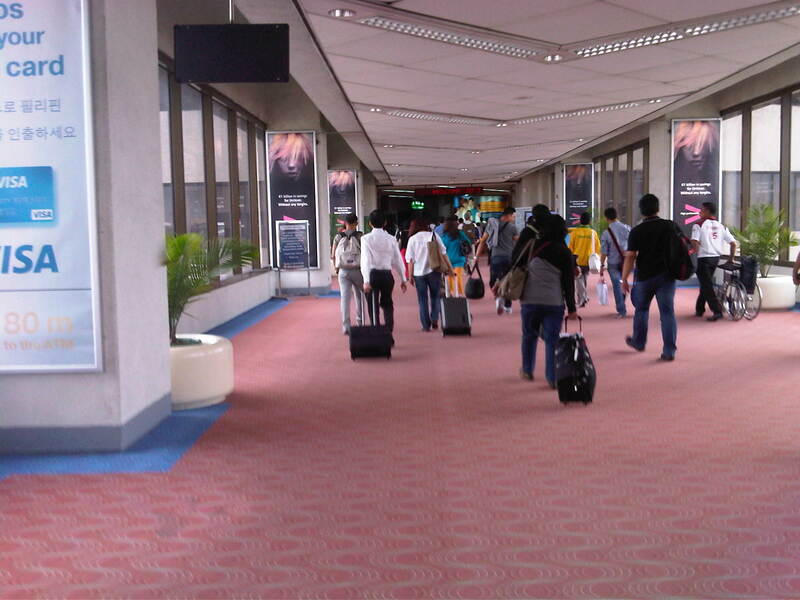 The corridors are definitely cleaner and neater than before (when Terminal 1 was heavily criticized as being one of the worst international airports in the world) and I think the tarps featuring tourist destinations around the Philippines help promote the country. 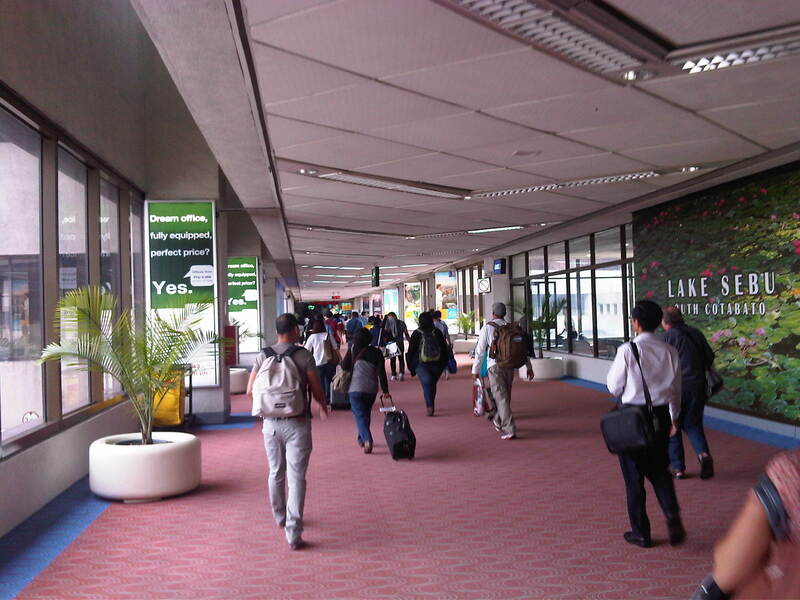 The corridors are spacious enough and the walk is not so long to require moving walkways or “walkalators.” There are staff and equipment at the end of the corridor scanning for indications of high body temperature usually associated with flu. 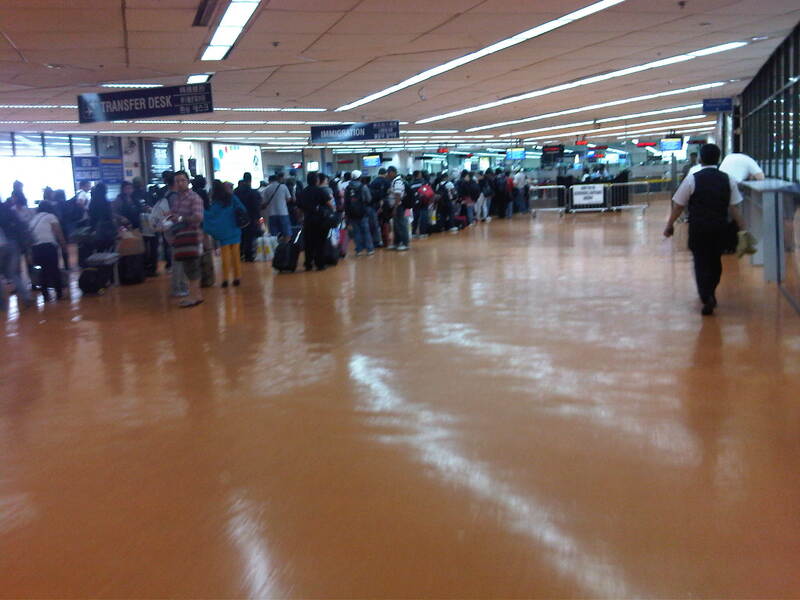 There are still long queues at the immigration counters despite additional booths and personnel posted at Terminal 1. 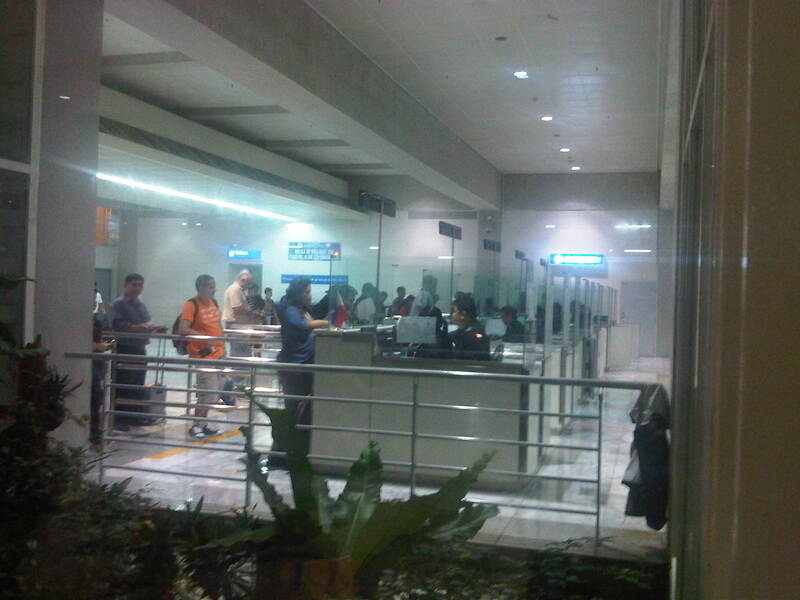 There are separate counters for Philippine passport holders and those bearing passports from other countries. 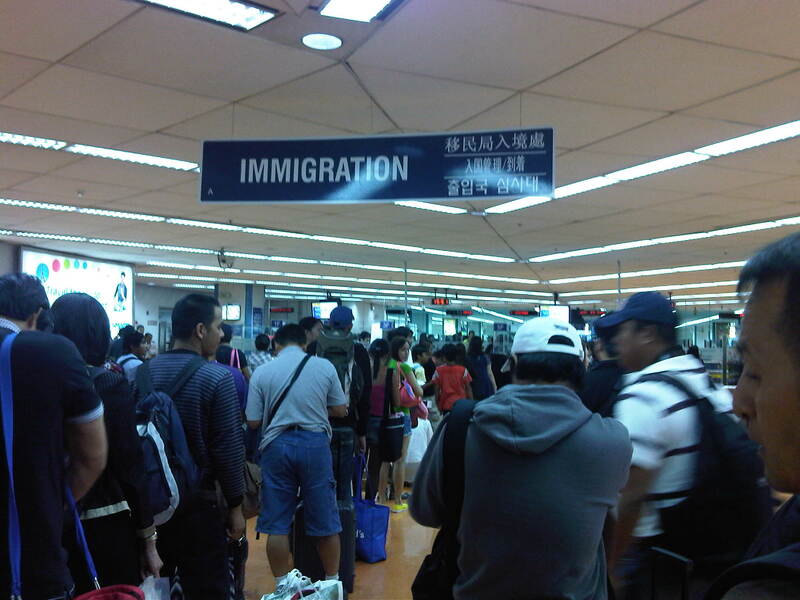 Previously, there were special counters for Overseas Foreign Workers (OFW). 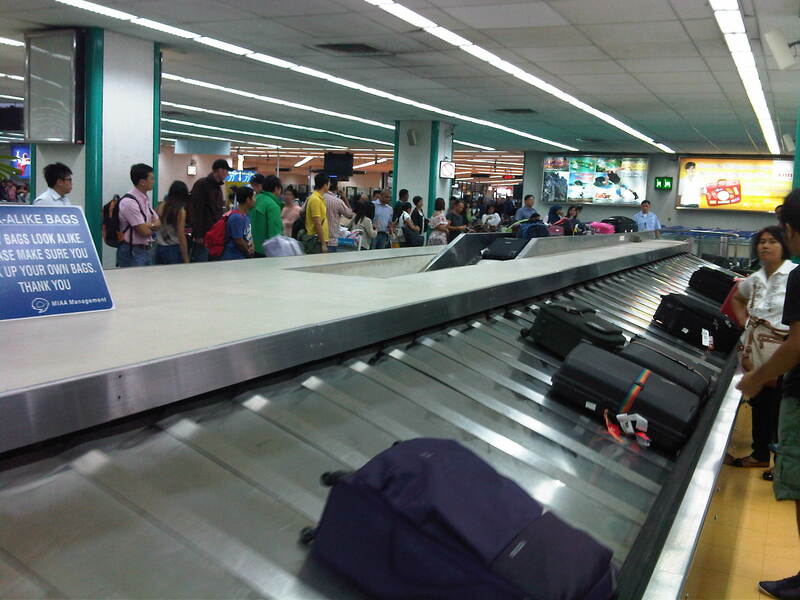 Checked-in luggage emerge and move along at the carousel for our flight. 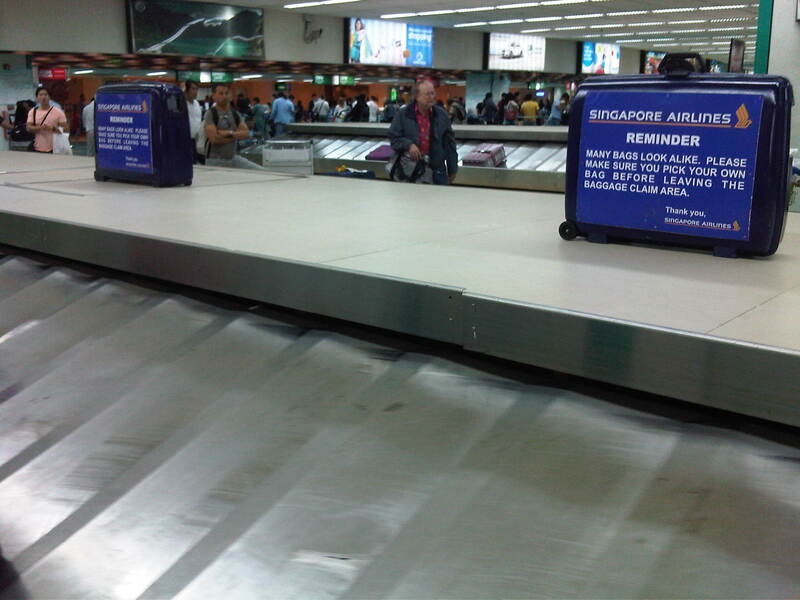 Singapore Airlines placed these signs on old luggage to caution passengers on picking up or identifying luggage from the carousel. 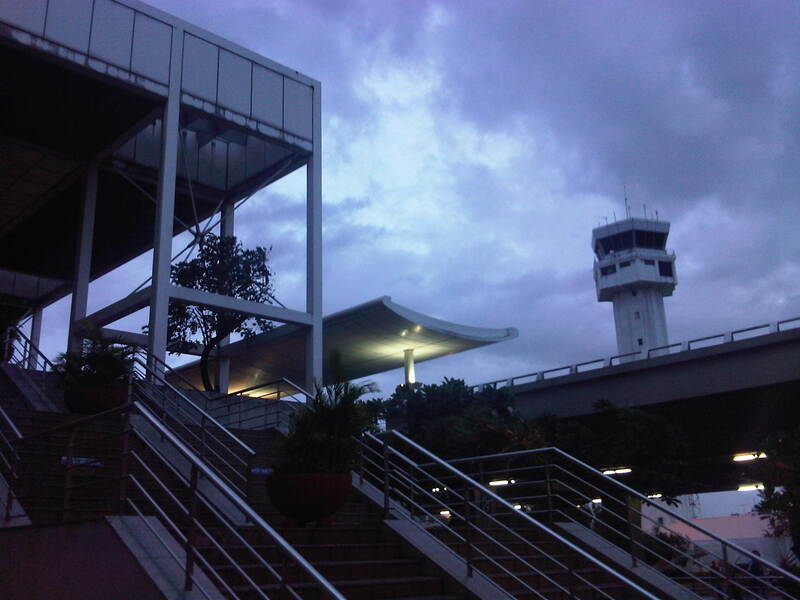 Changi Airport currently has four terminals including the Budget Terminal serving low-cost airliners particularly Tiger Airways and Cebu Pacific. Each terminal seem to have a unique design and collectively they are regarded as one of the best if not the best airport in the world. 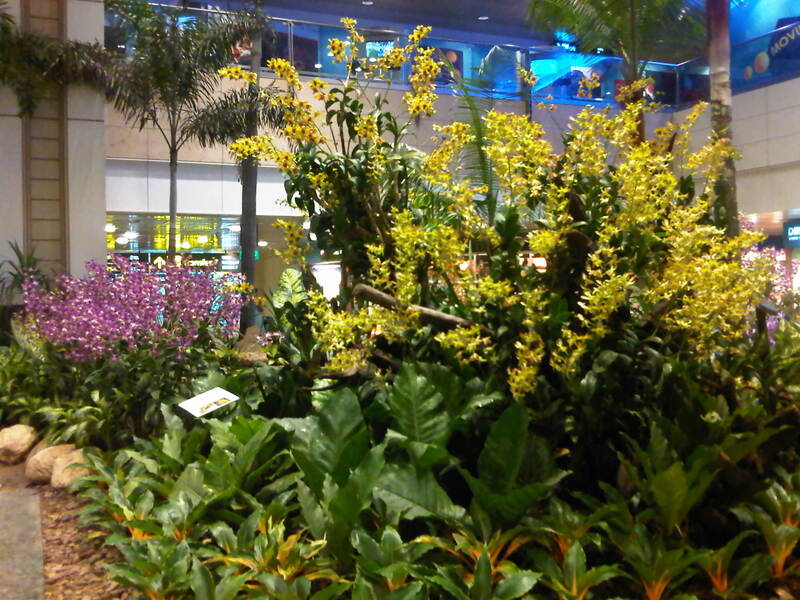 Terminal 2 has an indoor garden featuring orchids, ferns and palm trees. 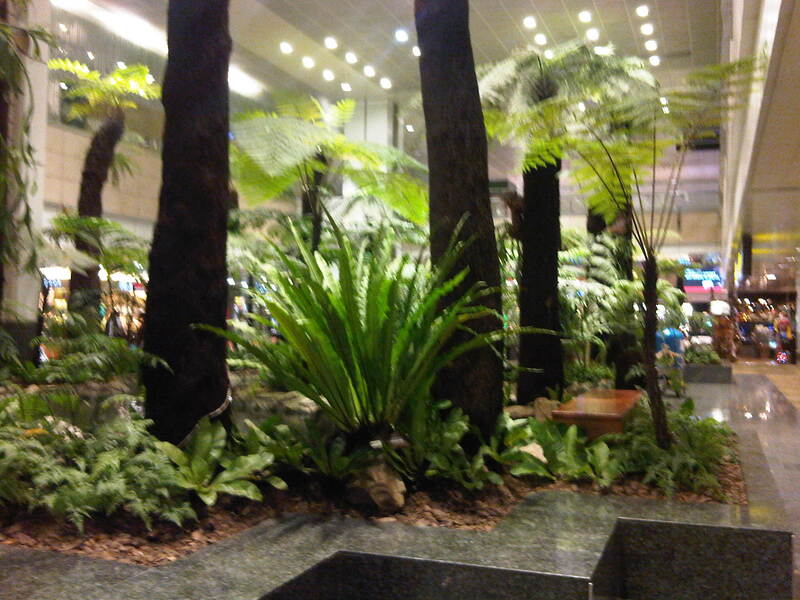 I took a few photos of the plants at the Changi Airport Terminal 2 in Singapore. 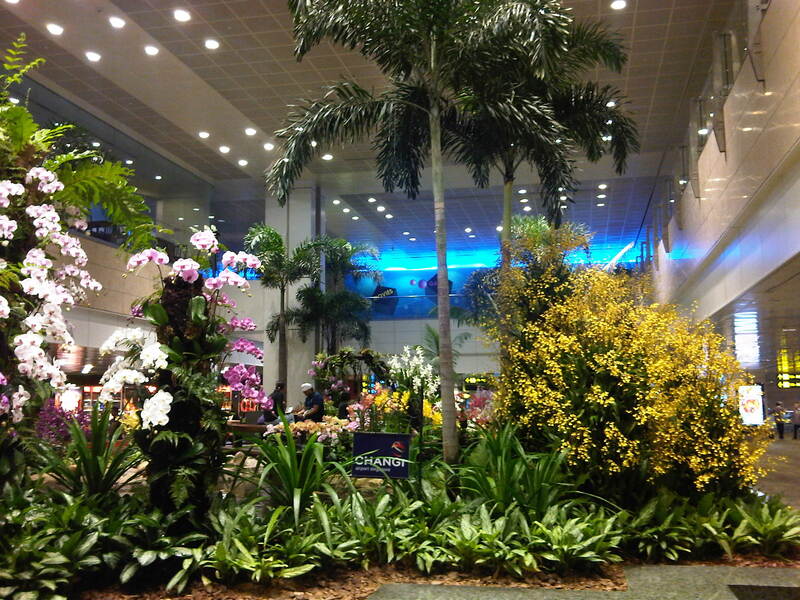 The orchids and other tropical plants provide a nice touch to the airport and seems to be an added attraction for visitors. 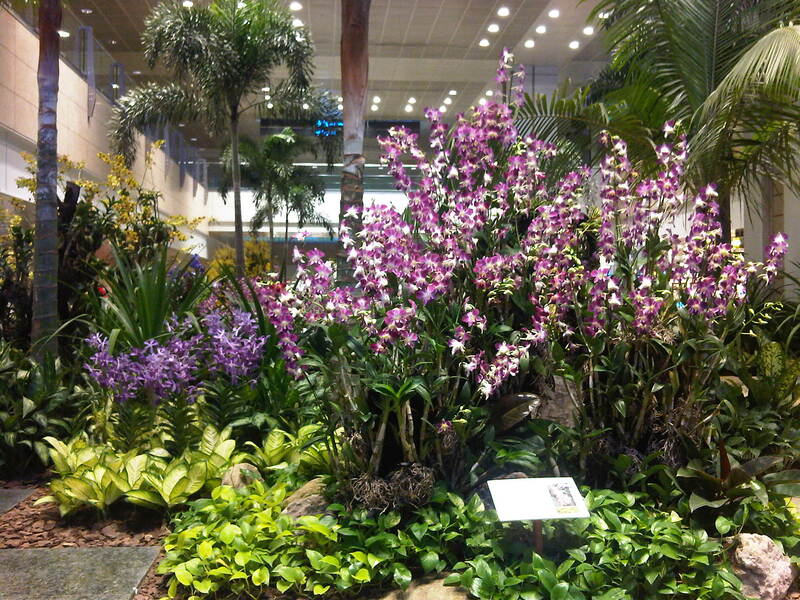 I spotted a few tourists taking photos with the plants, particularly the orchids in the background. 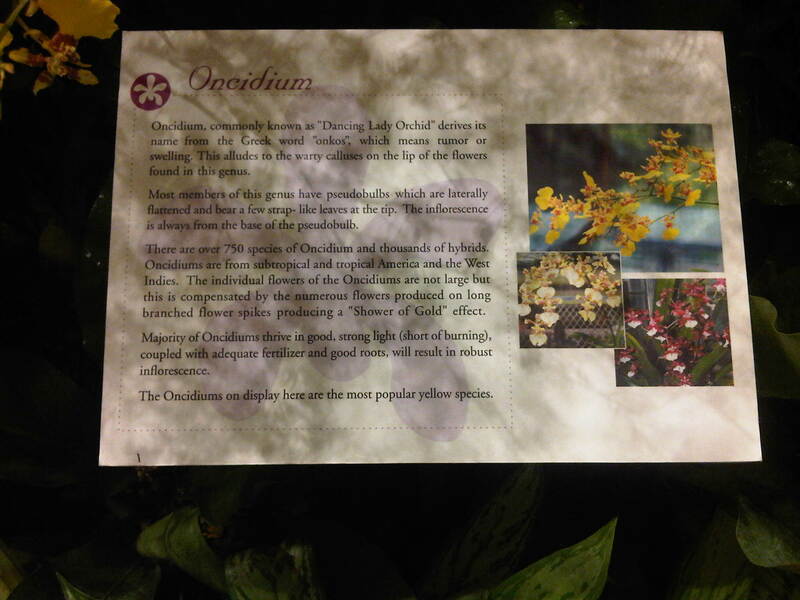 The orchids are endemic to Southeast Asia and I do remember some of them from my mother’s garden as well as others I’ve seen elsewhere including at the University. 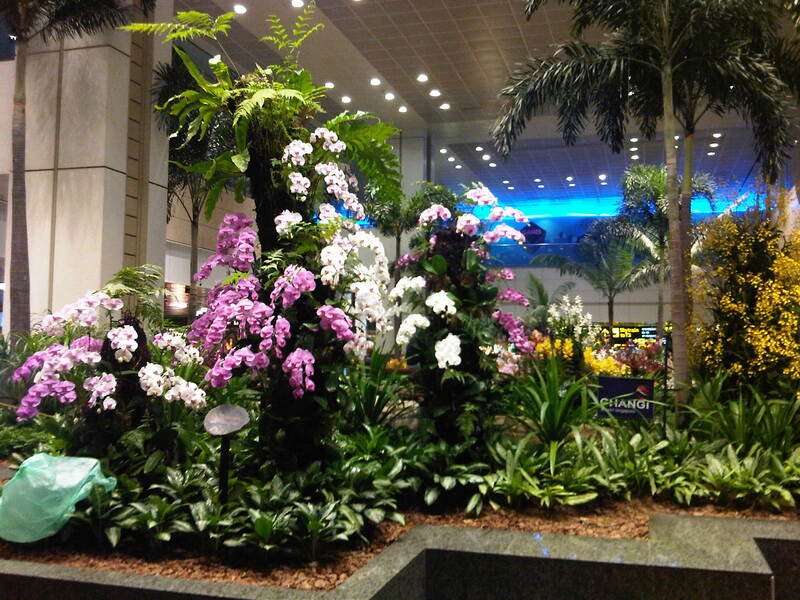 Orchids of different colors help make the terminal “alive” and perhaps contribute to a more relaxed and pleasing environment indoors. 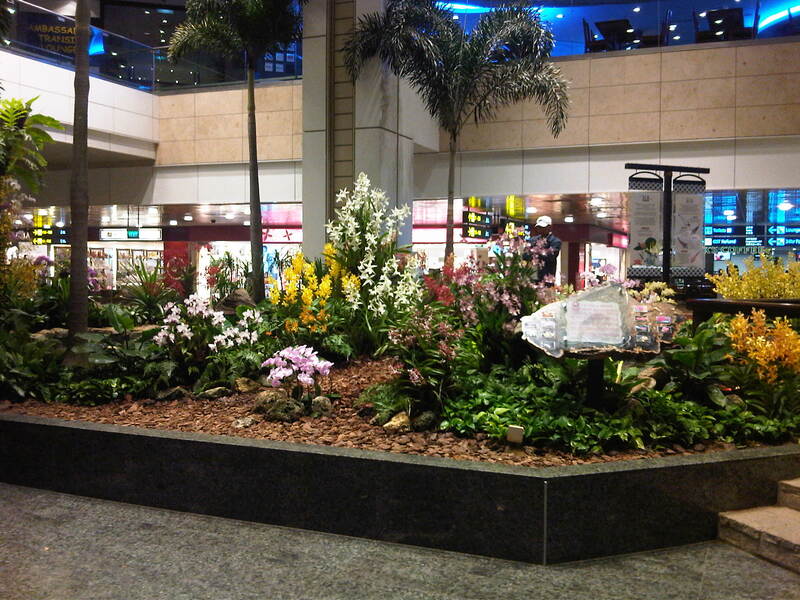 Perhaps Philippine airports should also consider having such gardens within the terminals to enhance the in-door environments. There are surely many plants and flowers that can be featured here including endemic ones like orchids, jasmine, and hibiscus varieties. 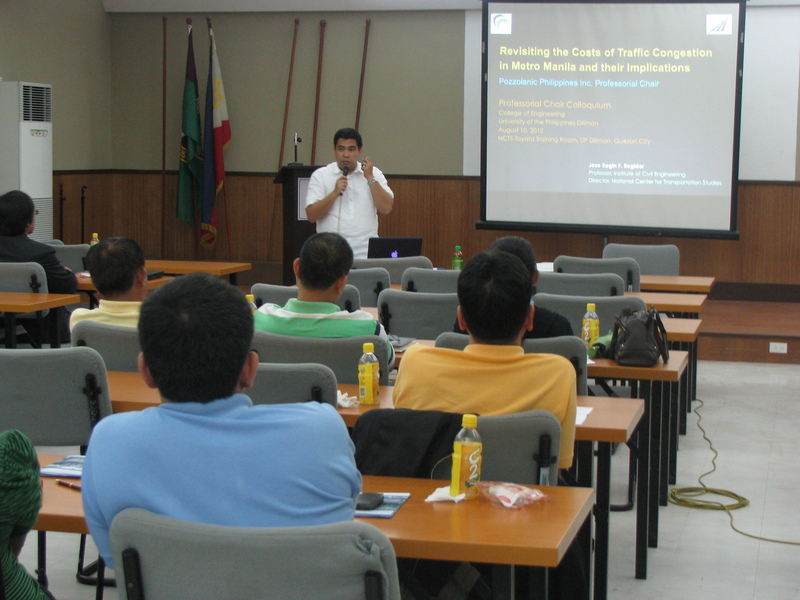 The Transportation Engineering Group of the Institute of Civil Engineering of the University of the Philippines Diliman held a special session for its Professorial Chair Lectures last August 10, 2012 at the Toyota Training Room of the National Center for Transportation Studies. 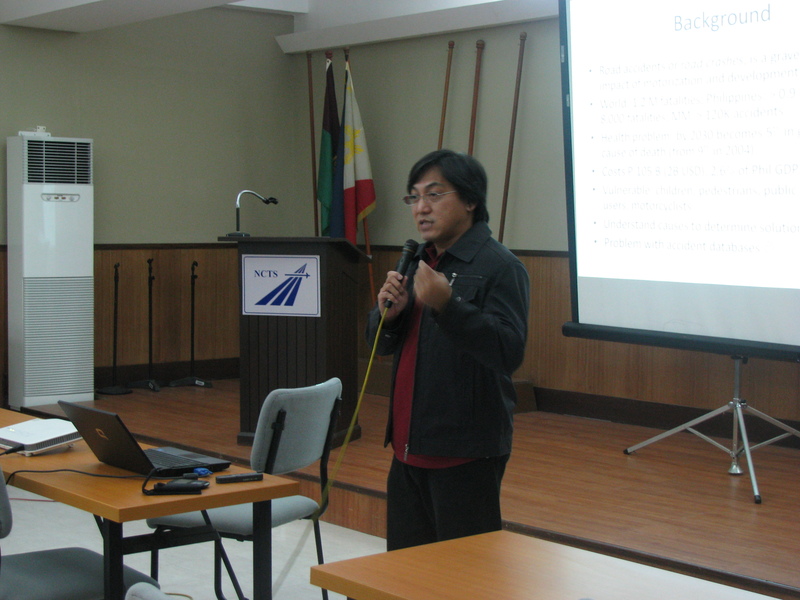 Four lectures were delivered by ICE faculty members who are also Research and Extension Fellows at the NCTS. 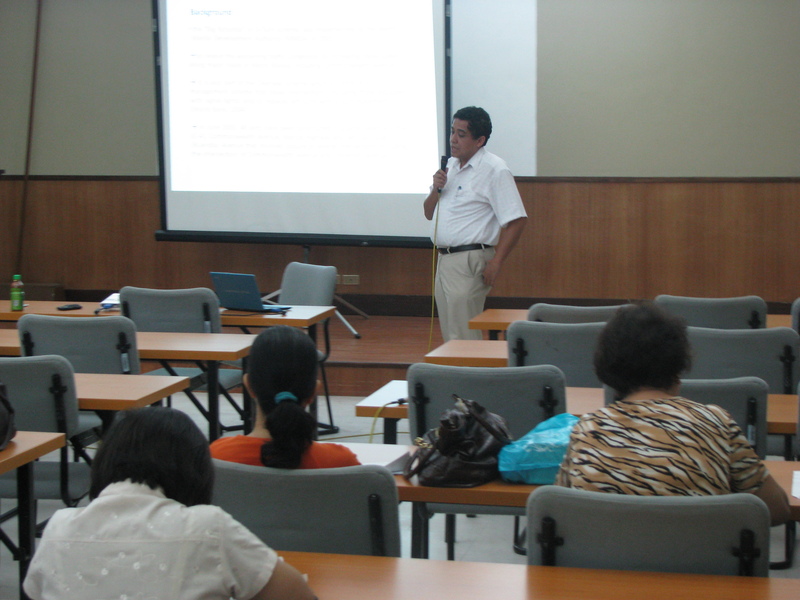 Following are a few photos taken during the colloquium. 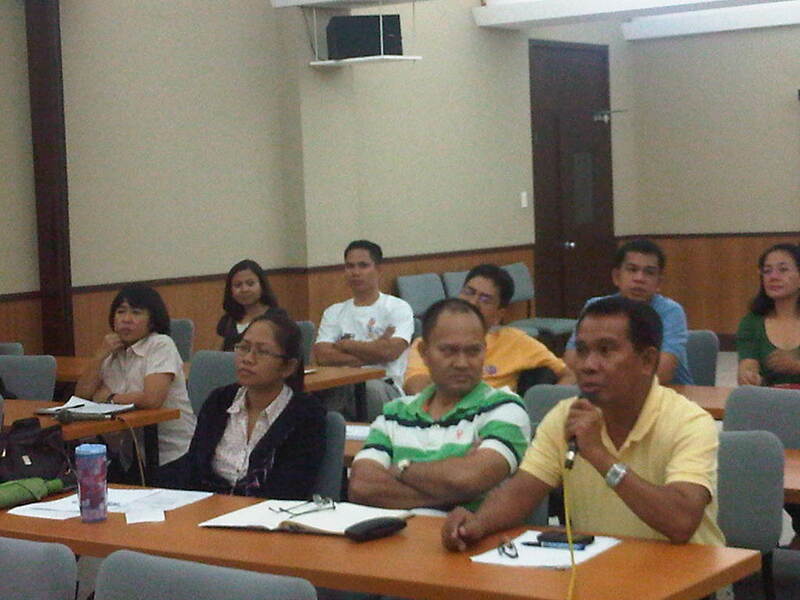 Audience consisting of various participants including those from the DPWH, DOTC and MMDA who were invited for the colloquium. 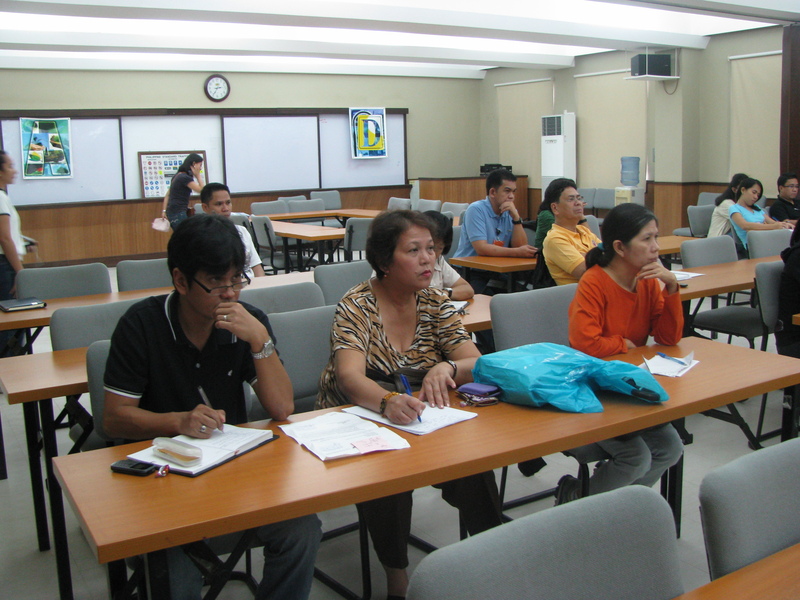 Graduate students and technical staff from the College of Engineering and the National Center for Transportation Studies also attended the lectures. Unfortunately, classes were suspended that week due to the monsoon rains that resulted in widespread flooding in Metro Manila so undergraduate students were not able to attend the colloquium. The presentation files may be found in a previous post where links for downloading are provided. These may also be found in the NCTS website. 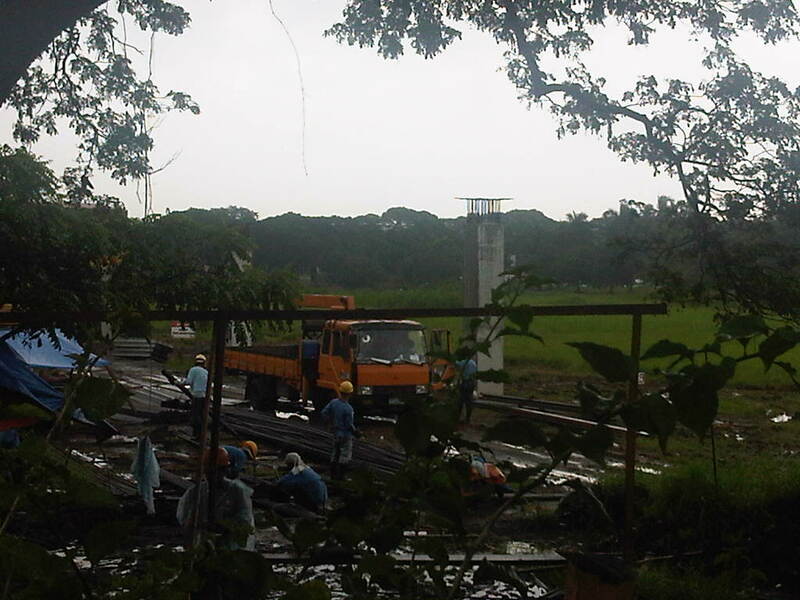 Visiting the site at the University of the Philippines Diliman (UPD) where a test track for the Department of Science and Technology’s (DOST) is currently being constructed, one wonders if this is a precursor of a transit system that might eventually replace the ubiquitous jeepneys plying several routes within the campus. There have been misleading stories about this “replacement” going around the internet and being passed on from one person to another. I am aware of both as I regularly see posts in some online discussion threads that make it appear as if the UP administration and DOST are in discussion for a mass transit system to replace the IKOT jeepneys. They are not in any such discussions that I am aware of considering I am a member of the UP Diliman Transportation Committee. Perhaps people are inspired by an existing system in Germany at the University of Dortmund. I caution the reader against making any sweeping conclusions as UP Diliman’s travel demand characteristics are quite different from that of the University of Dortmund’s. 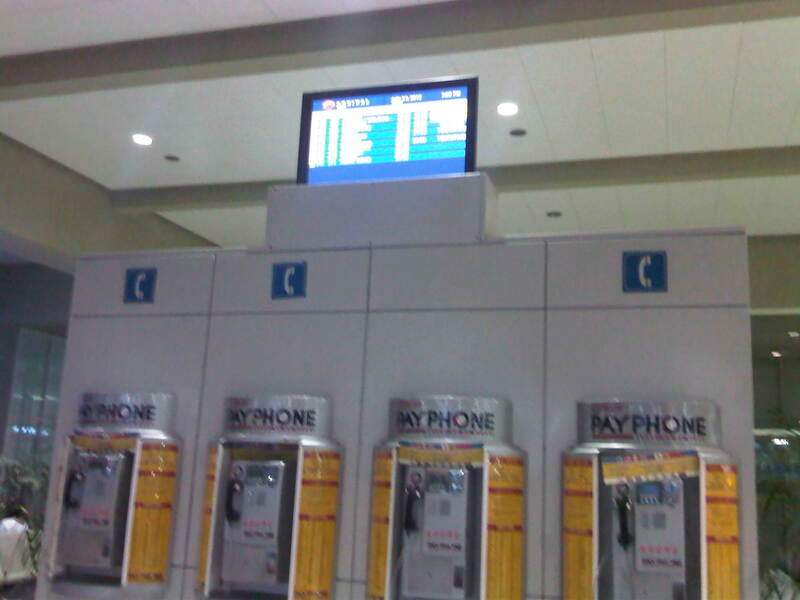 I also get asked a lot about what will happen to the jeepneys once the “monorail” is operational. My response is always that nothing will happen to them because there simply won’t be a monorail. 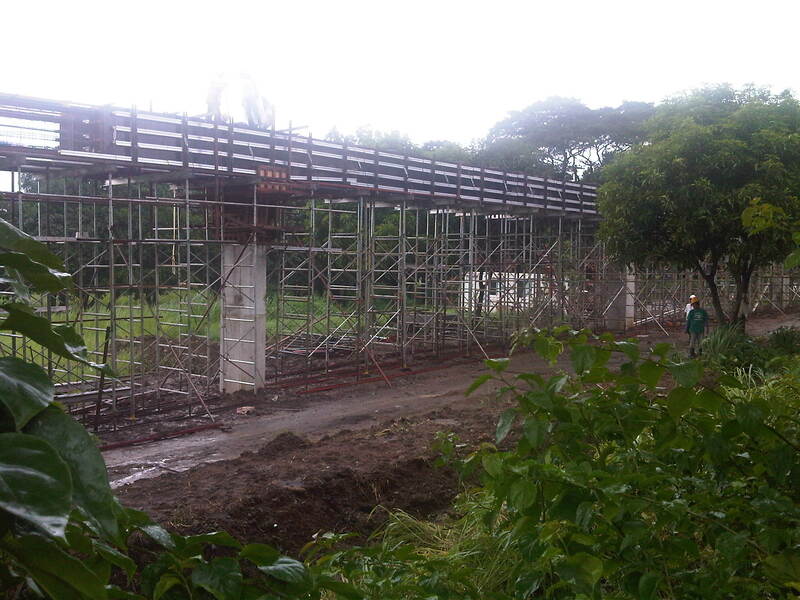 What is being constructed is the superstructure for the test track of an Automated Guideway Transit (AGT) prototype. Being a test track, its being operational means it can be used for research & development (R&D) for future systems (hopefully, homegrown) that can be constructed where they are needed and appropriate. 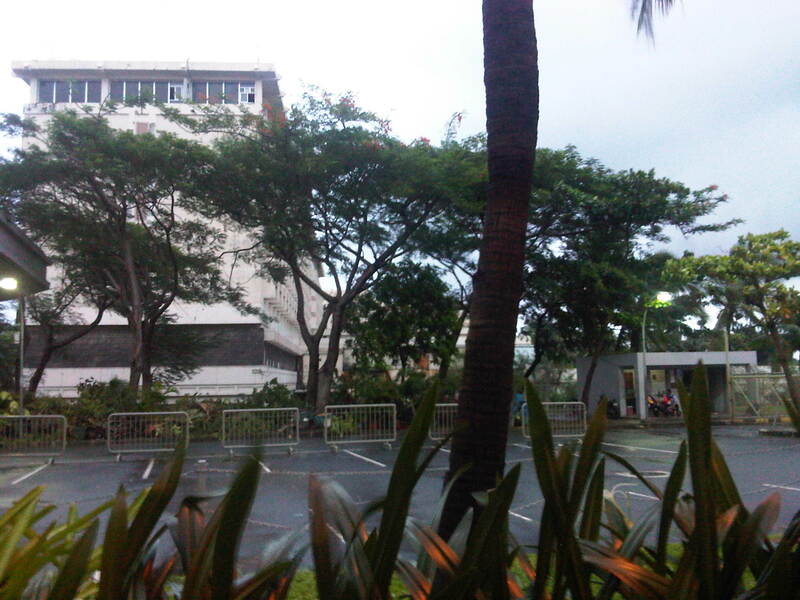 The site has been fenced off to minimize the appearance on-site of curious people (usiseros?). One such person even climbed a column to take photos of the construction work and posted these in the internet. 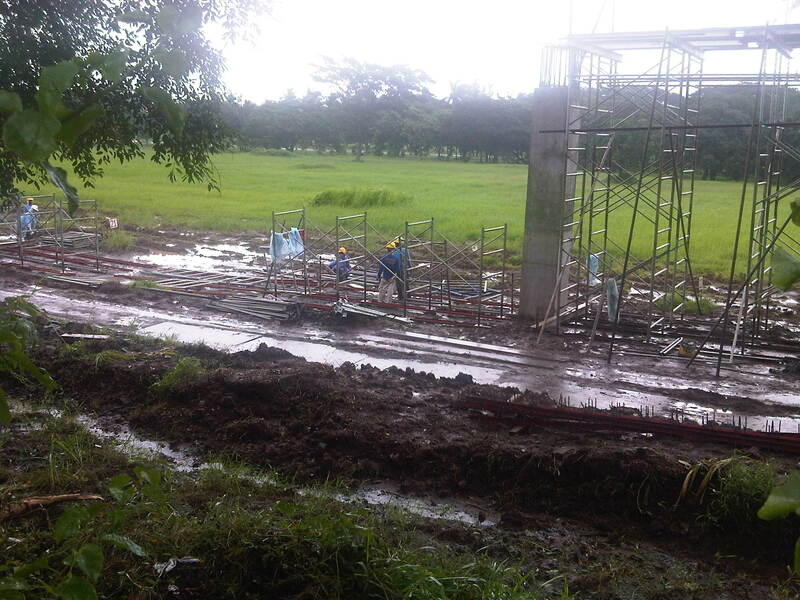 As this is a construction site, such incidents are not supposed to happen mainly due to safety concerns. 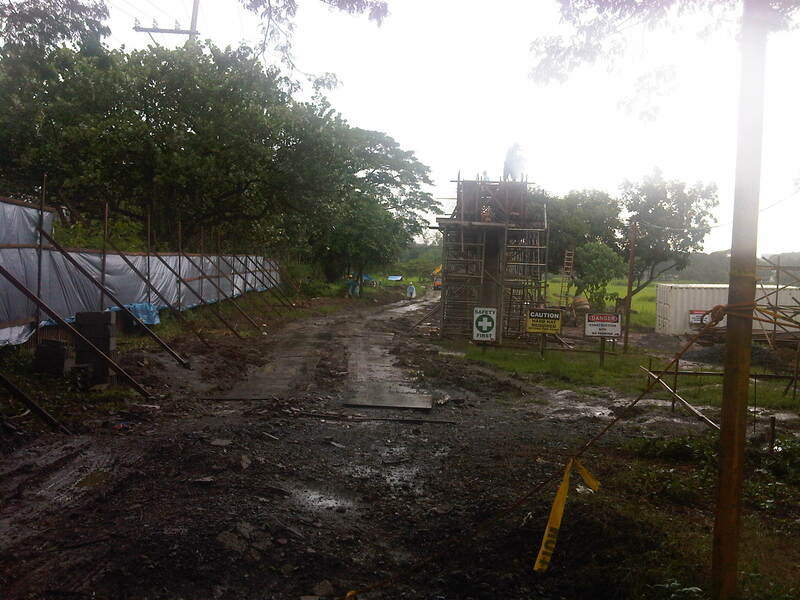 Construction work continues despite the wet weather. 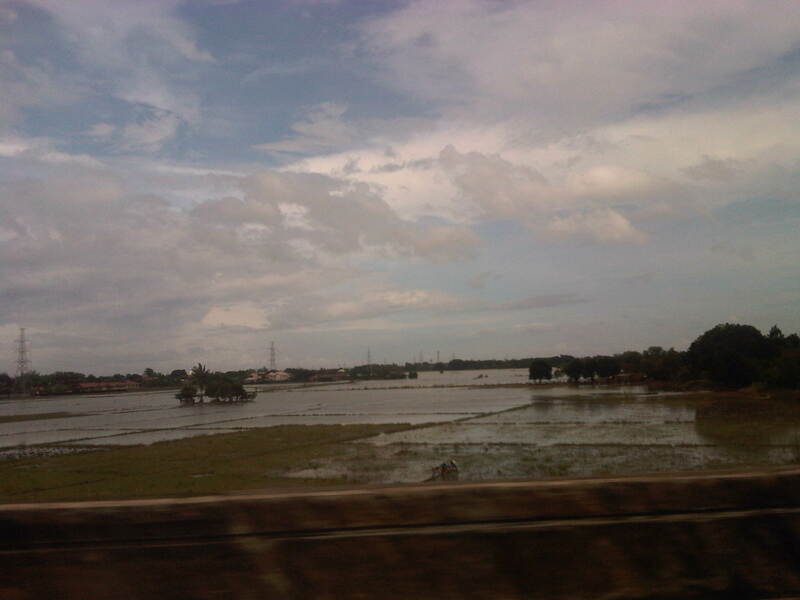 The week-long monsoon rains have rendered the ground muddy or mushy but workers are busy as if it were summer. The columns for the elevated structure are all in place but in various stages of completion. 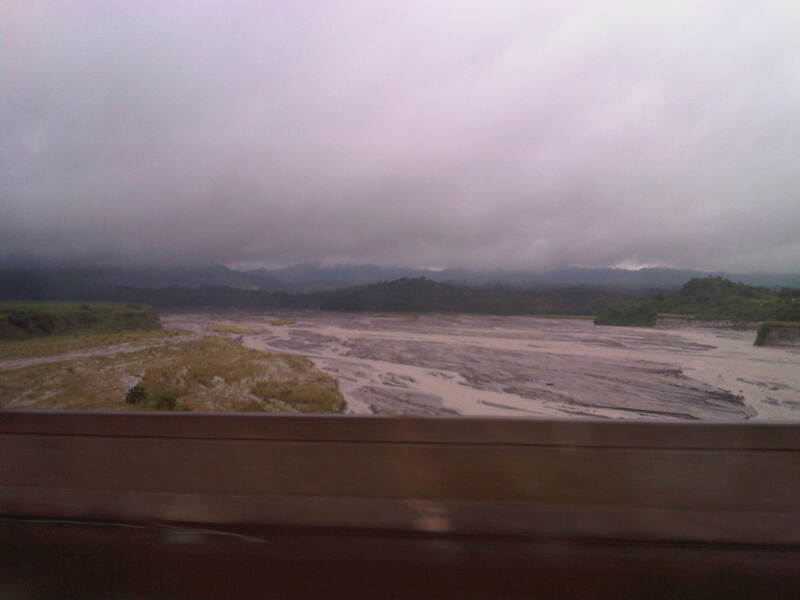 Those along C.P. Garcia until the intersection with the University Avenue only have the reinforcing steel bars in place and awaiting the pouring of concrete. Construction materials are piled up on top of tarp-covered ground as workers take some time-out from their work. The test track is supposed to be completed by October including the installation of power lines and a power station for the electric-powered vehicle. 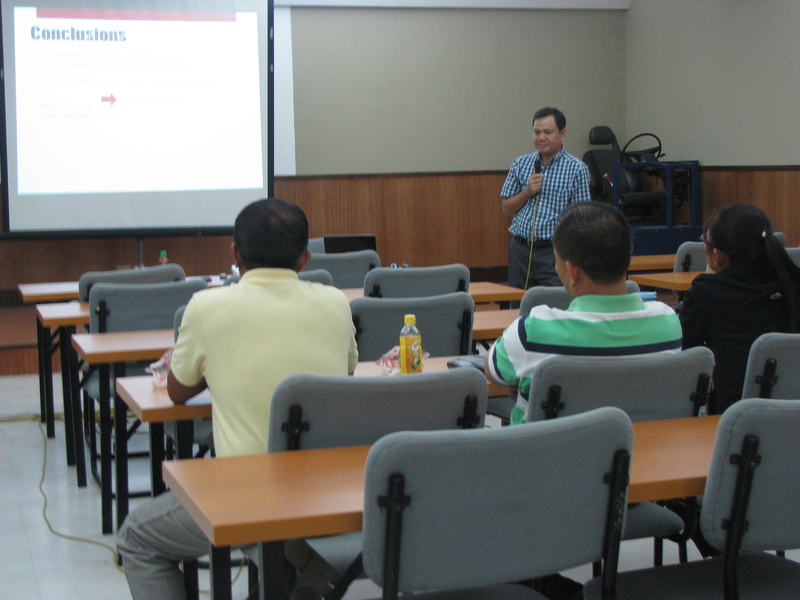 The DOST has also bidded out the assembly of the vehicle that will be used for the experiments. Hopefully, the vehicle will be ready by the time the test track is completed. It is expected that the AGT would have manned tests by late November or early December, in time for a demonstration before or on the day of UP Diliman’s Lantern Parade. 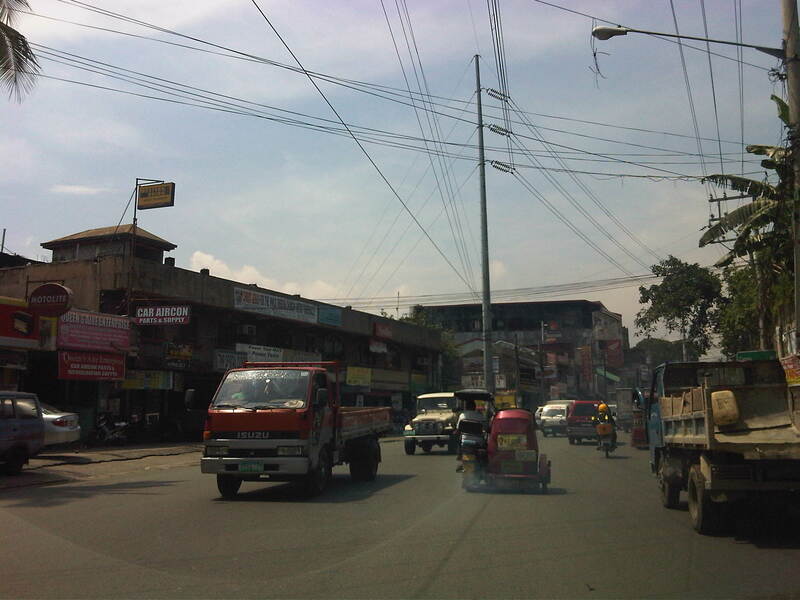 Sumulong Highway stretches from its intersection with A. Tuazon Ave. and A. Bonifacio Ave. in Marikina City, Metro Manila to the intersection with the Taktak Road or M.L. 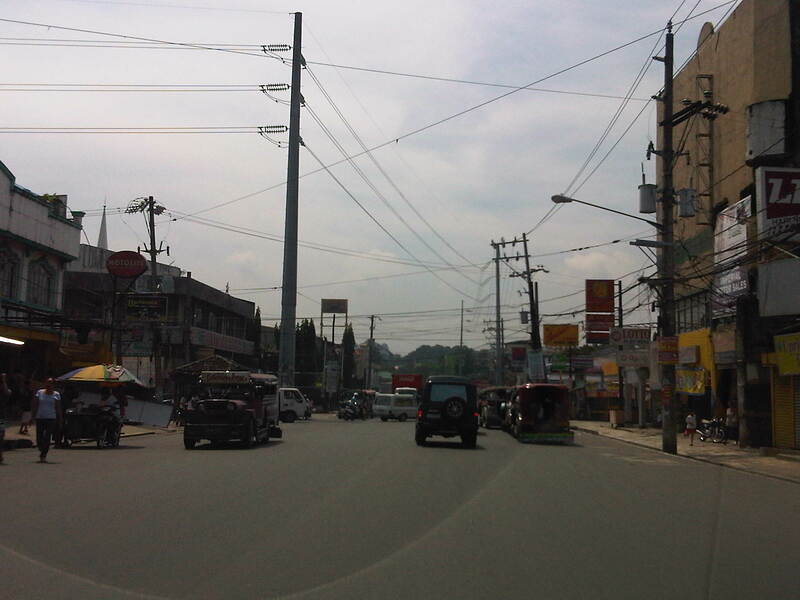 Quezon Ave. in Antipolo City in the Province of Rizal. 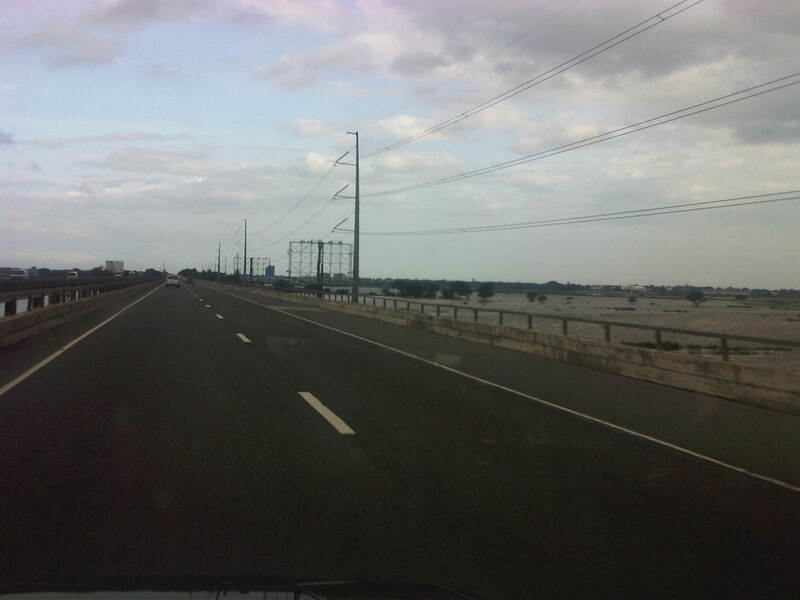 It serves both as an arterial (for Marikina and Antipolo) and a feeder (with respect to Marcos Highway). 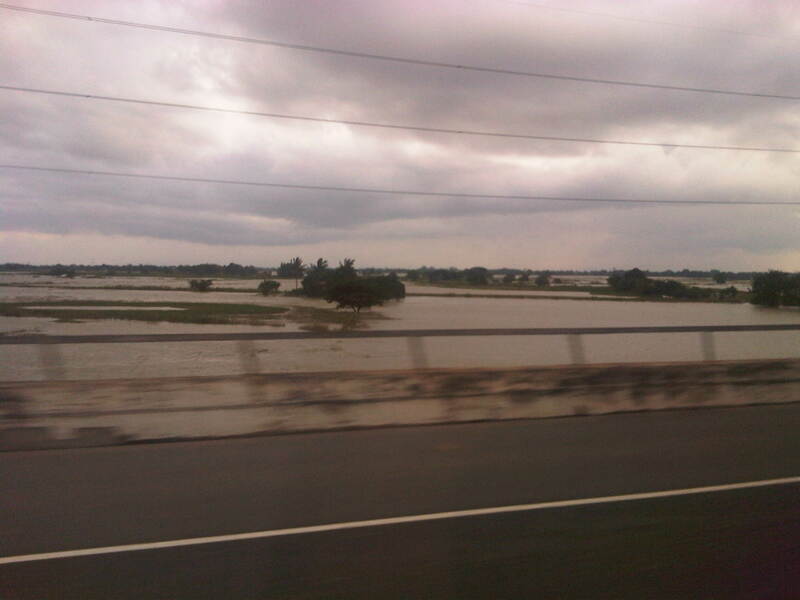 The following photos show the stretch from Marikina to Masinag that shows typical conditions along the highway. 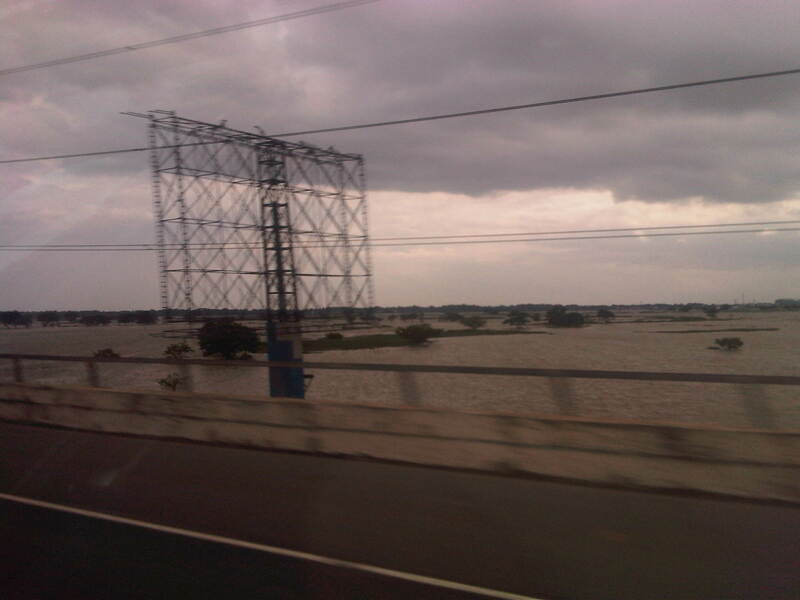 These conditions are quite different from those along the stretch from Masinag to Taktak Road in upper Antipolo City. 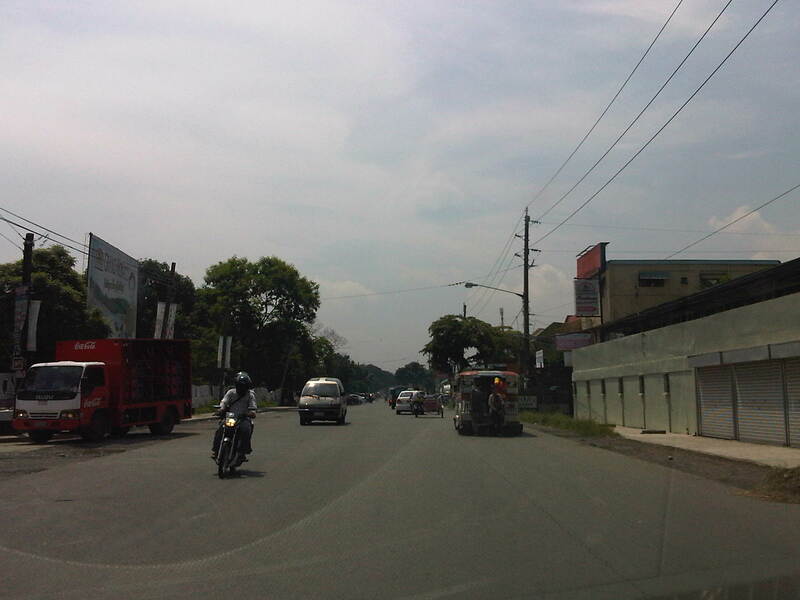 Sumulong Highway has a total of 4 lanes (2 per direction) but a lack of pavement markings make it difficult to ascertain the center of the road and the space allocation for traffic. This makes travel less safe as motorists assume they are traveling along the correct space on the road. 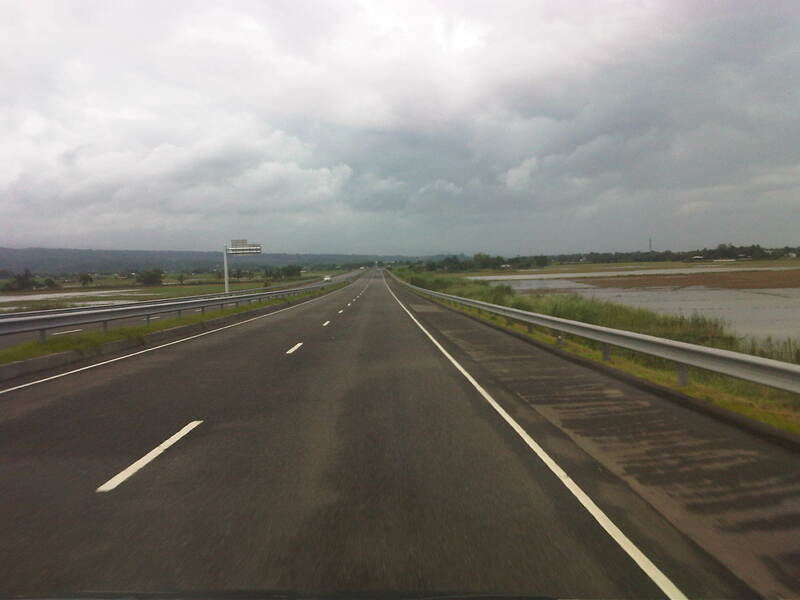 The asphalt-surfaced road has no lane markings but has very good pavement conditions. 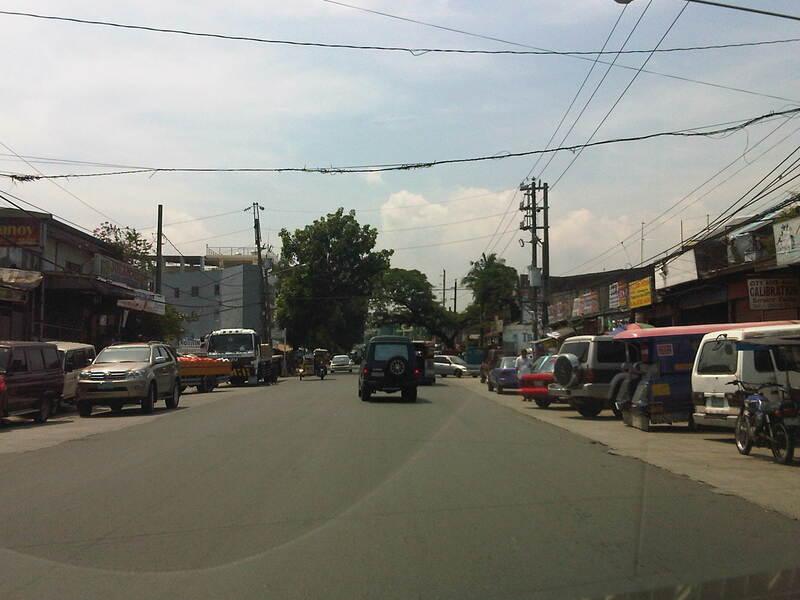 There is also significant on-street parking as most establishments along the highway have no adequate off-street parking spaces. The section shown above is right in front of a sabungan or coliseum for cockfights. 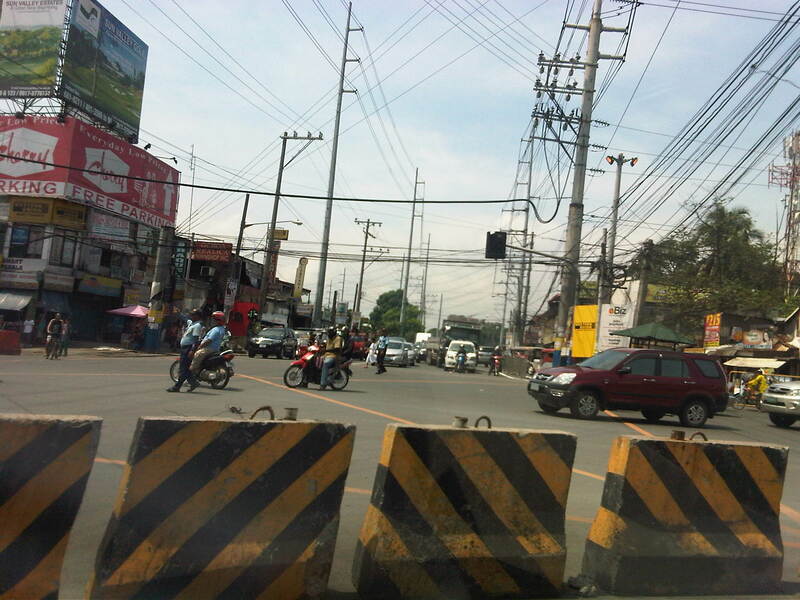 There are pedestrian crossings though, near intersections and where there are schools along the highway. 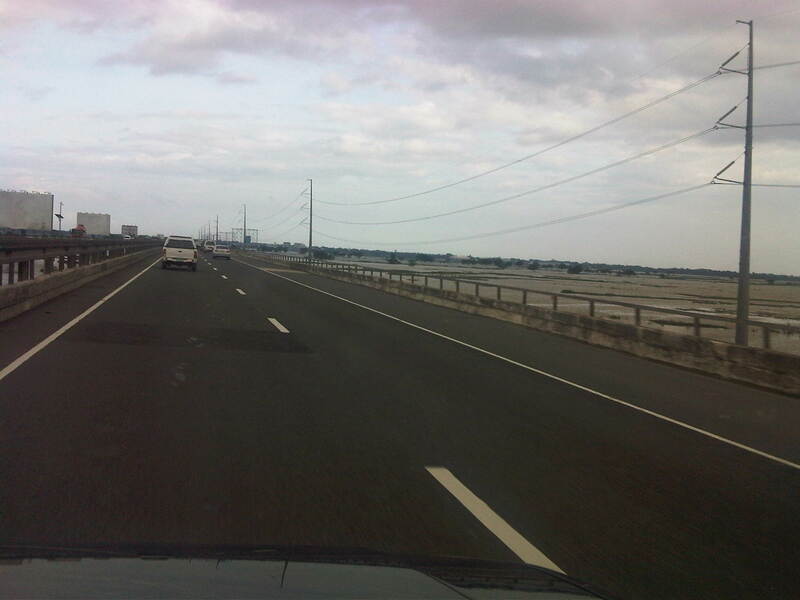 Only the traffic lanes have asphalt overlay, the shoulders have the concrete surface exposed thereby distinguishing them from the traveled way. 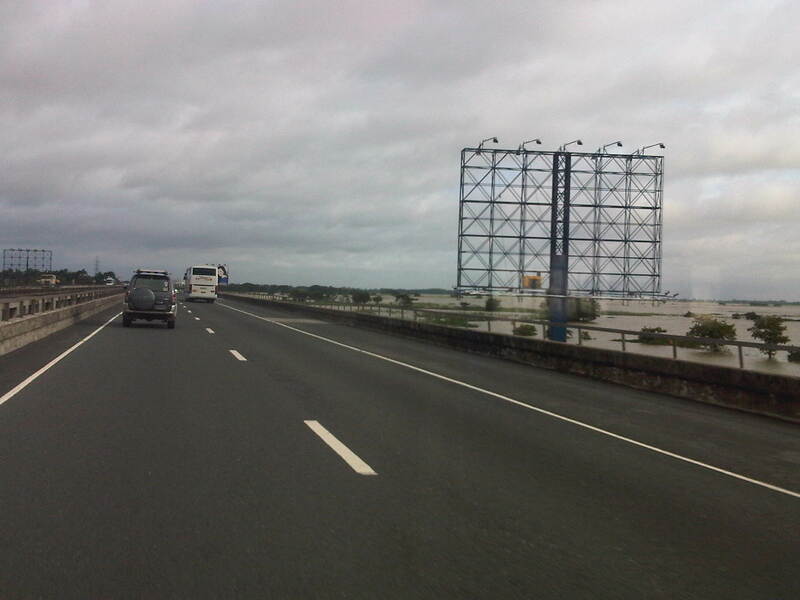 The shoulders are used as parking spaces for establishments along the highway as shown in the photo. 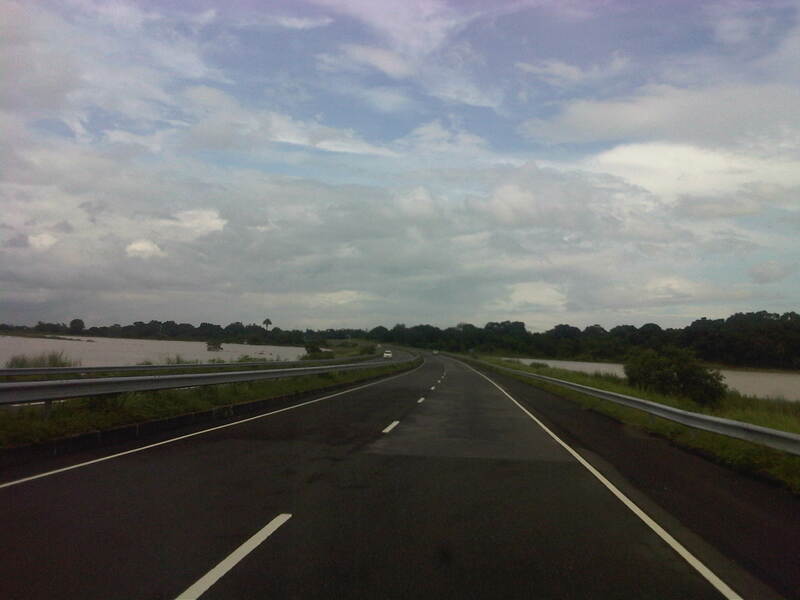 Such practices are also common along national highways around the country. 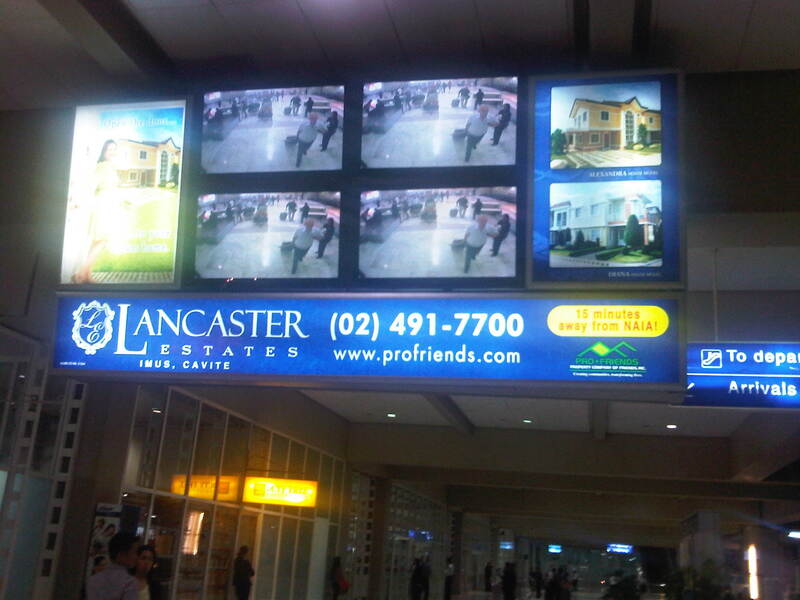 Even the barangay hall of Bgy. 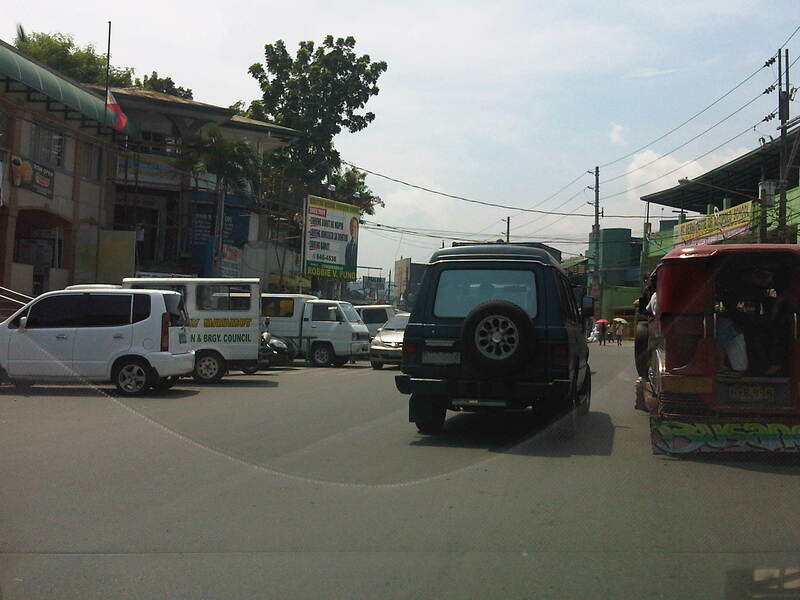 Mayamot utilizes road space for parking as shown in the left. 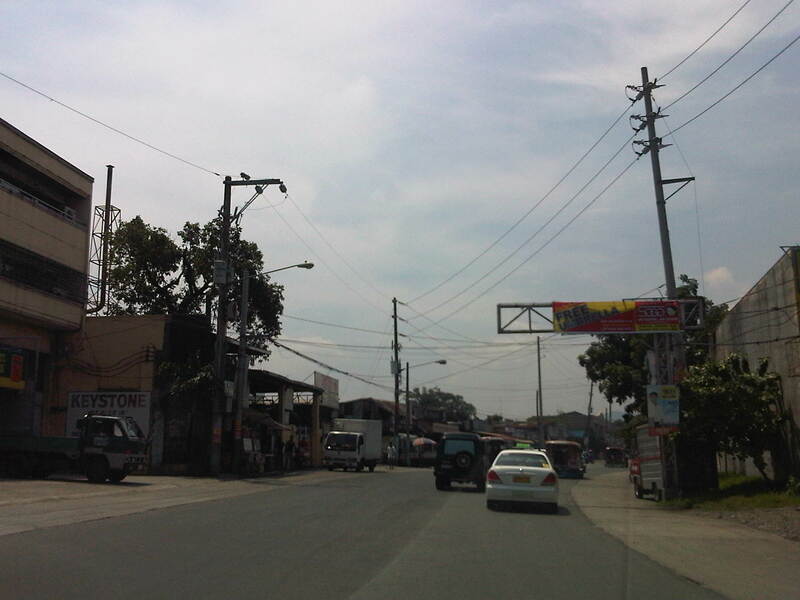 The Mayamot Barangay Hall is see on the left in the photo. 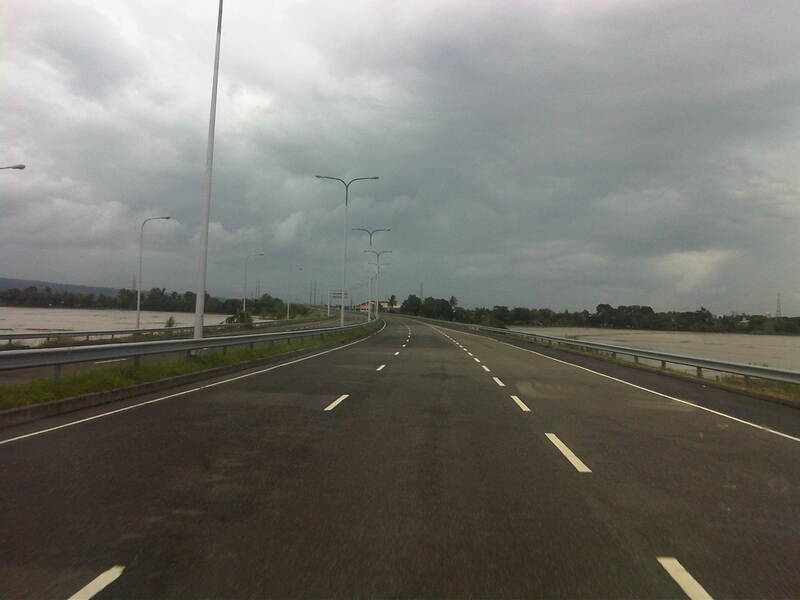 This effectively reduces road capacity leading to traffic slowing down at such sections. 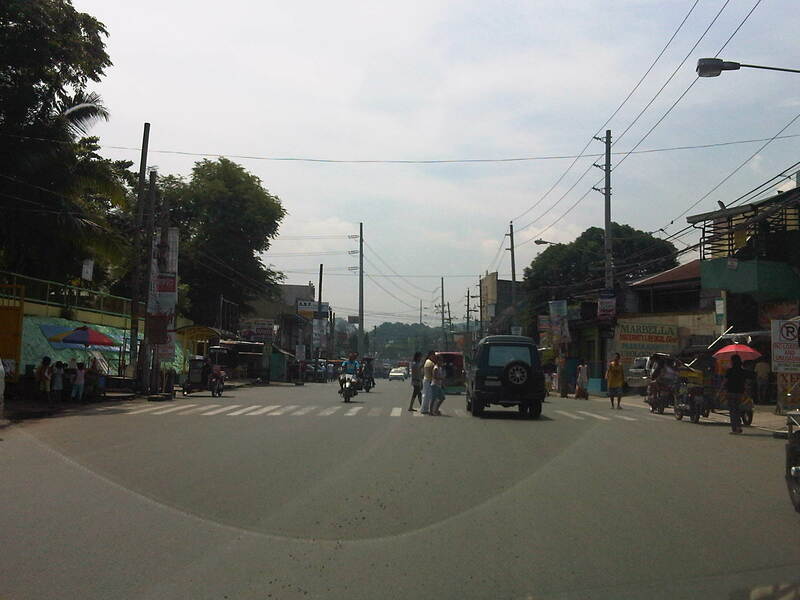 Another pedestrian crossing, this time in front of a public school right after the barangay hall. 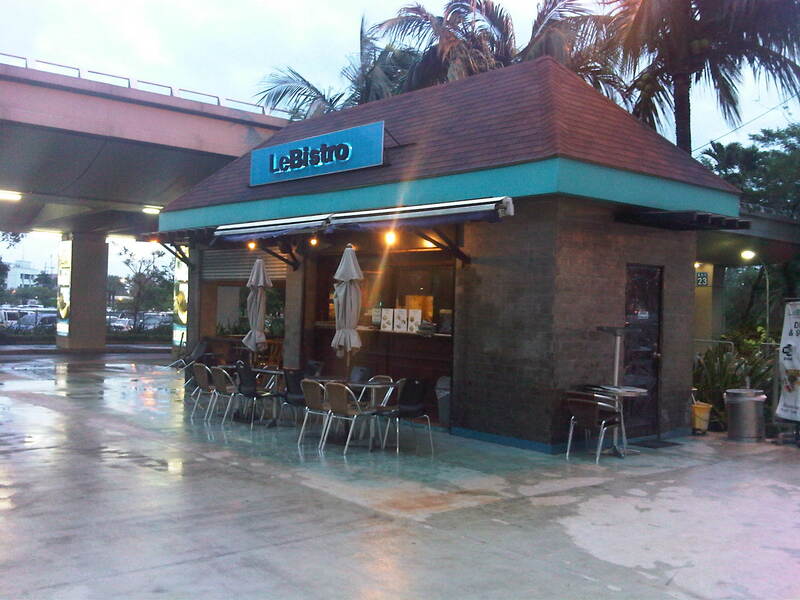 Some sections have sidewalks for people to walk along but these are also usually blocked or occupied by stuff from the establishments along the street. 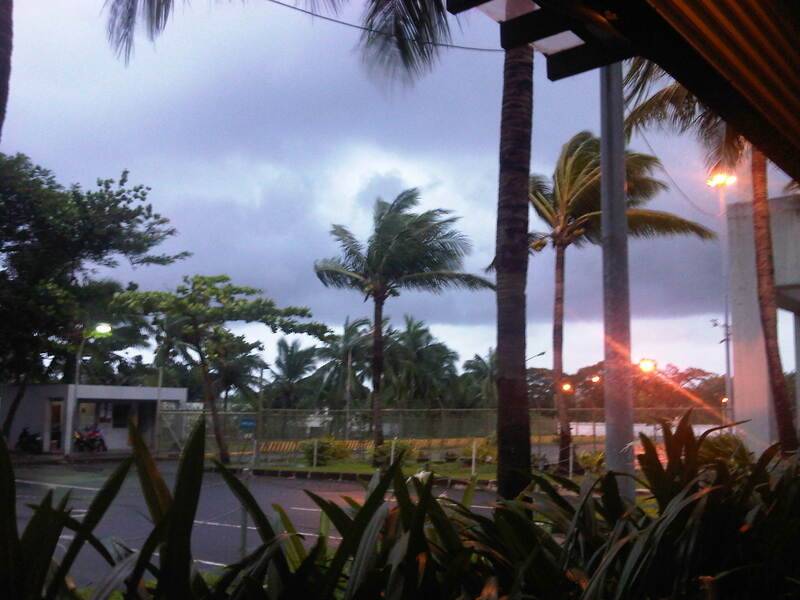 Waiting shed along the highway. I could not say its typical because the more recent ones usually have names or initials of politicians on them. This shed is likely to be old and uses clay tiles for roofing. 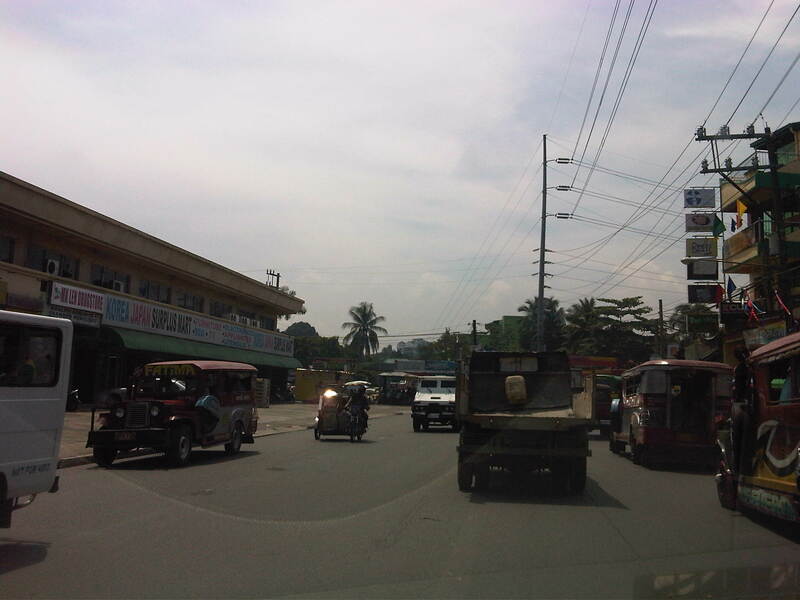 There are also tricycles along the road due to the sidestreets and subdivision entrances connecting to the highway. Public utility tricycles are supposed to be prohibited from using national roads but are common in most provincial areas and CBDs where they are the main mode of transport. 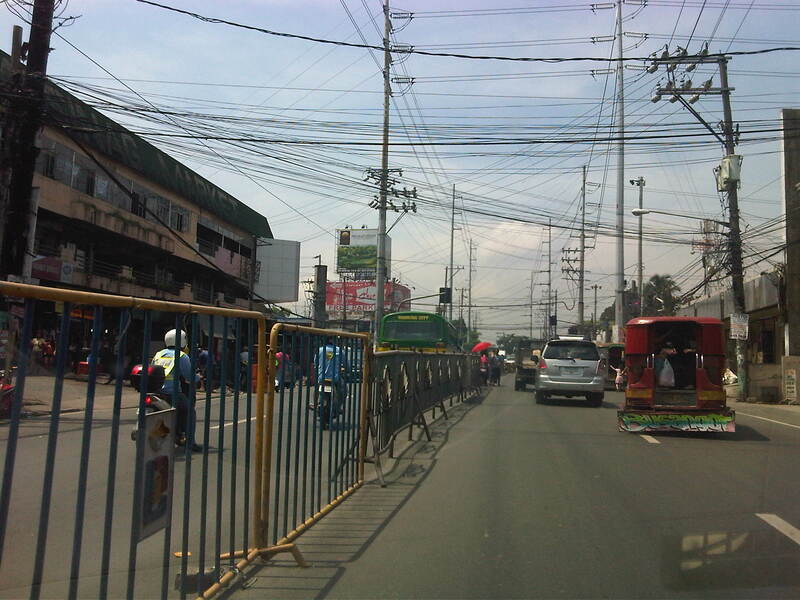 In this case, tricycles should be prohibited from using the highway as they are already competing with jeepneys, serving larger areas aside from what should be individual subdivisions or residential districts. 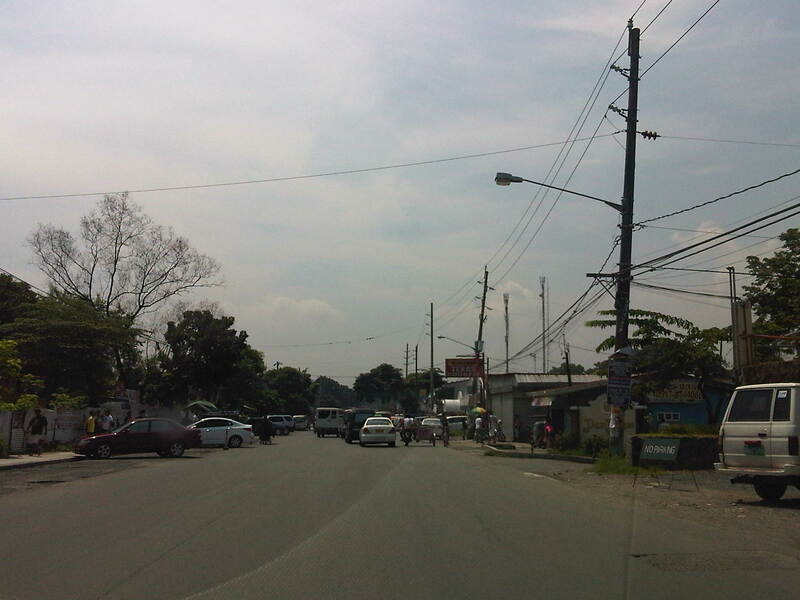 There are many auto repair and supply shops along this stretch of Sumulong Highway. 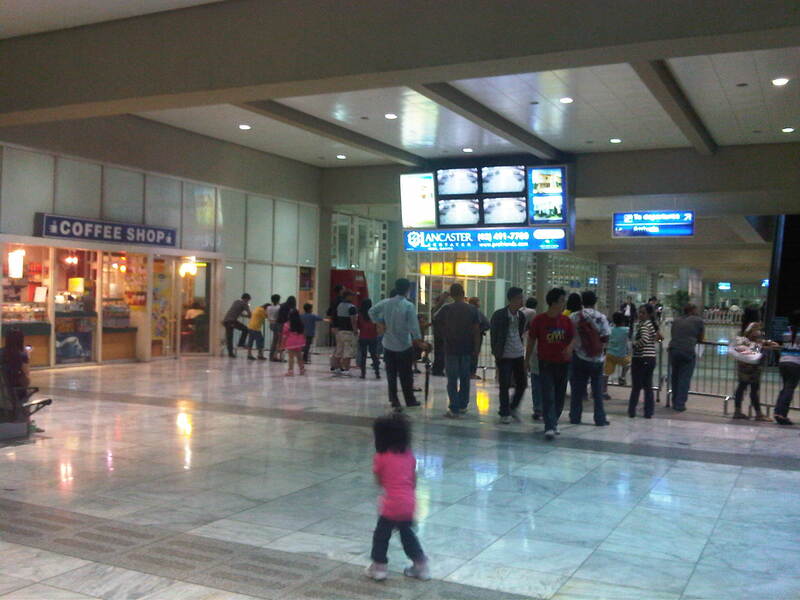 Such shops typically have many customers who also park along the highway, often occupying road space and causing congestion. 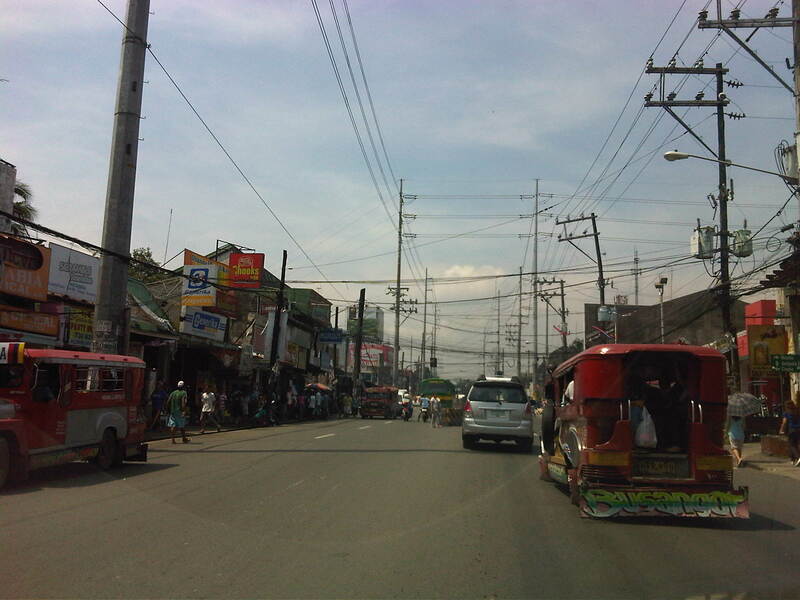 Approaching the Masinag junction, which is the intersection of Marcos and Sumulong Highways, one sees more commercial establishments on either side, mostly small stores or shops. 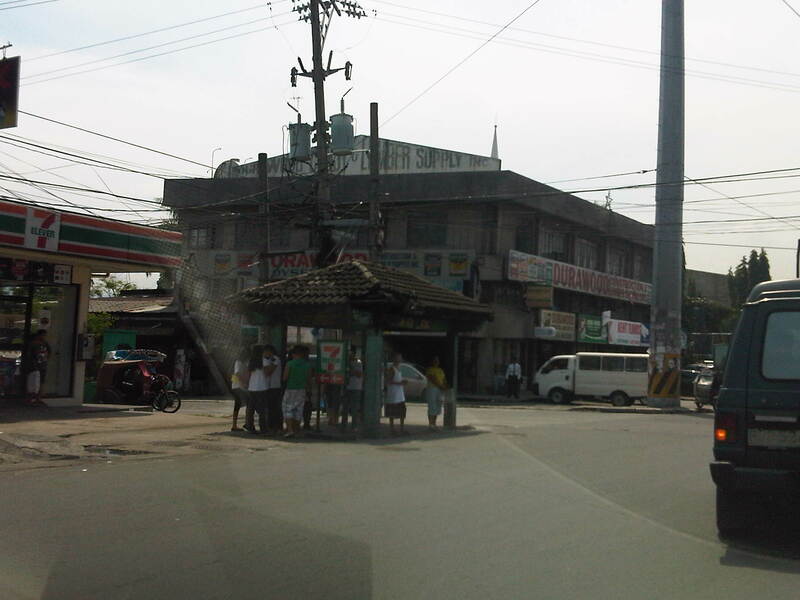 At the junction is the Masinag Wet Market, which is now in decline after major commercial developments have been constructed in the area including the most recent SM City Masinag. 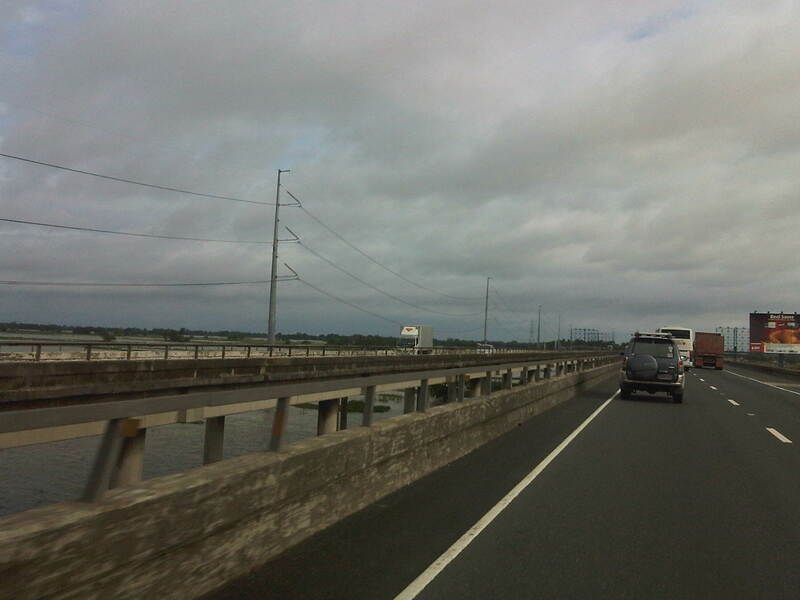 Steel barriers placed along the center of the highway to discourage jaywalking – some barriers have been moved by pedestrians to create space for illegal (and risky) crossings such as what is seen just downstream in the middle of the photo (notice the person with the red umbrella?). 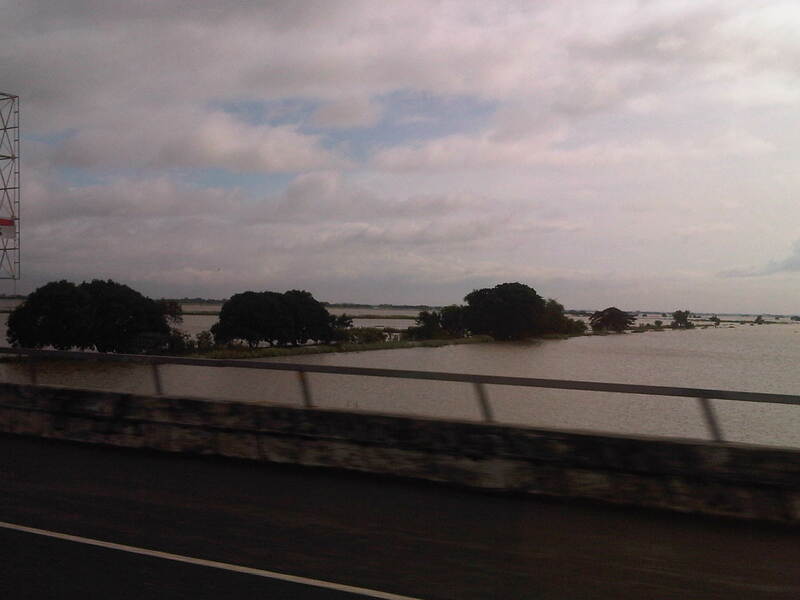 Portions of this section of Sumulong Highway are prone to flooding including the intersection with V.V. 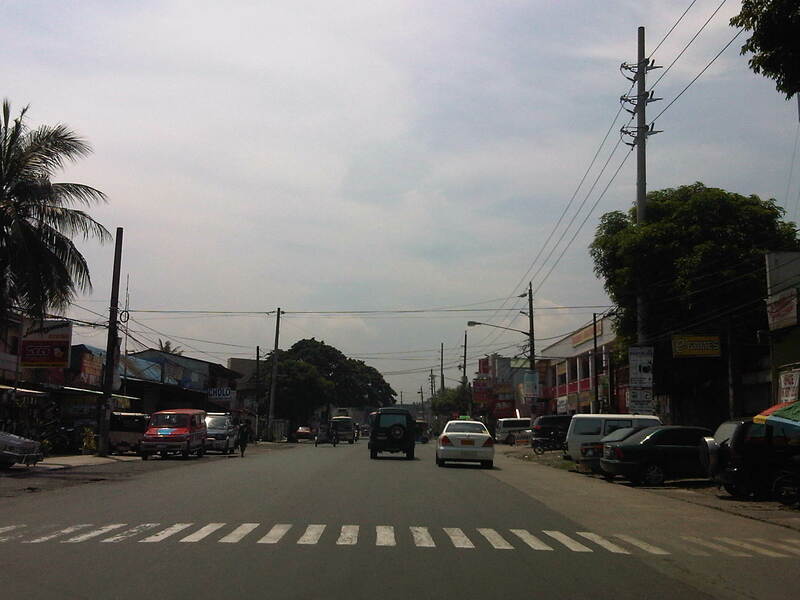 Soliven Avenue, which leads to SSS Village and other subdivisions. 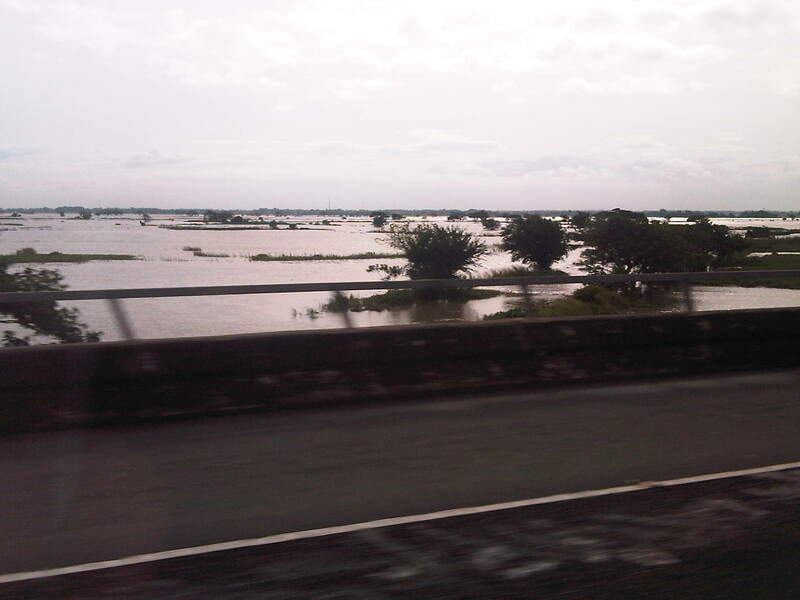 The more recent floodings were due to the heavy monsoon rains from a couple of weeks ago that effectively isolated residential areas in Marikina and Antipolo as vehicles could not exit the subdivisions to major roads like Sumulong and Marcos Highways. 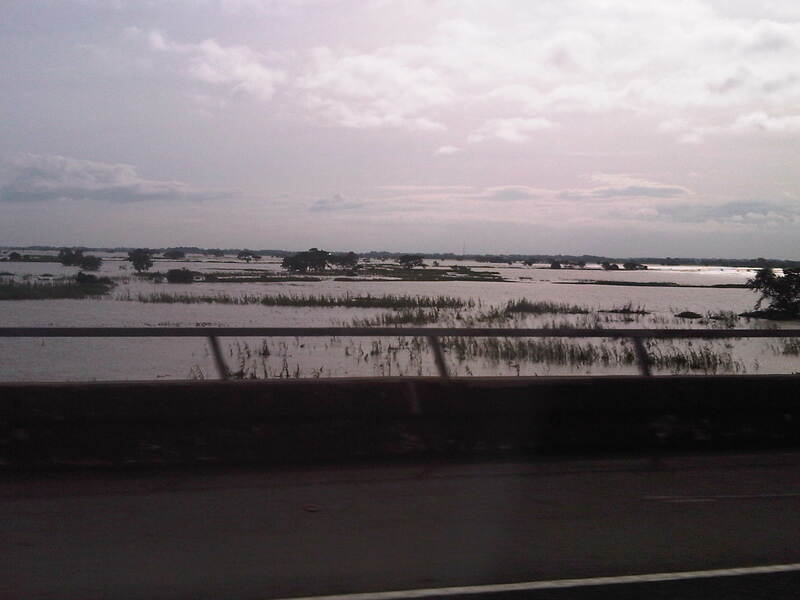 It’s quite interesting to note that the drainage systems along these roads including Sumulong have not been upgraded to be able to accommodate run-off from what is turning to be heavier rains due to climate change. 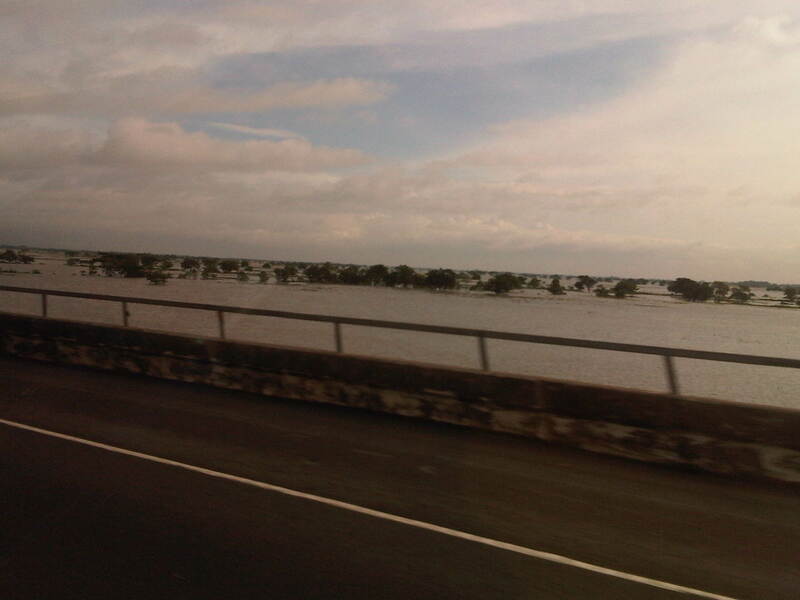 Thus, it may be expected that the same sections will be flooded should there be heavy rains particularly due to typhoons and other major weather systems affecting Metro Manila and its environs.